Died: 15th September 1917; age 41; Died of Enteric Fever – Bombay, Maharashtra, India. 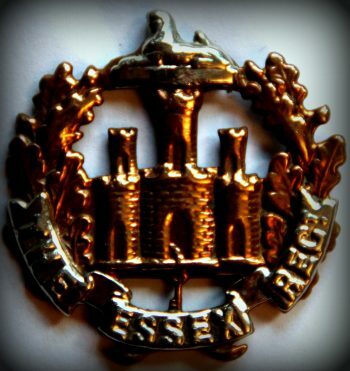 Rank: Private; Service Number: 25588; Regiment: Essex Regiment, 2nd Garrison Battalion. Relatives Notified & Address: Husband of H.L. Collins, of 10, Little Barclay Street, Ipswich. 1881 15, Little Barclay Street, Ipswich. Thomas was 4 years old and living with his parents & sister. Thomas Edward Collins, 35, a Cordwainer, born Portland Square, Norwich, Norfolk. Sarah Ann Collins (nee Leason), 36, a Laundress, born Norwich. Sarah Ann Collins, 2, born Ipswich. 1891 17, Upper Street, Ipswich. Thomas was 15 years old, an Errand Boy. He was living with his mother, sister & step father. William Finch, 45, a Tailor, born Ipswich. 1901 11, Little Wosley Street, Ipswich. Thomas was 24 years old, worked in Engineering. He was married and Head of the Household. 1911 10, Little Wolsey Ipswich. Thomas was 34, a Corporation Labourer – Ipswich Sanitary Labourer. He was Head of the Household. Father-in-Law – William Skippings, 65, a widower, a Maltster, born Stonham, Suffolk. Thomas’s father Thomas Edward Collins died, 1882, Ipswich. Thomas William Hector Baden Collins, born June 1900, Ipswich. William Collins, born 1902, Ipswich. John Edward Collins, born 1908, Ipswich. Herbert F. Collins, born 1911, Ipswich. Stanley E. Collins, born 1915, Ipswich.